Based on in-situ observation, satellite and reanalysis data, responses of the western North Pacific subtropical ocean (WNPSO) to the slow-moving category 5 super typhoon Nanmadol in 2011 are analyzed. The dynamical response is dominated by near-inertial currents and Ekman currents with maximum amplitude of 0.39 m/s and 0.15 m/s, respectively. The near-inertial currents concentrated around 100 m below the sea surface and had an e-folding timescale of 4 days. The near-inertial energy propagated both upward and downward, and the vertical phase speed and wavelength were estimated to be 5 m/h and 175 m, respectively. The frequency of the near-inertial currents was blue-shifted near the surface and redshifted in ocean interior which may relate to wave propagation and/or background vorticity. The resultant surface cooling reaches -4.35°C and happens when translation speed of Nanmadol is smaller than 3.0 m/s. When Nanmadol reaches super typhoon intensity, the cooling is less than 3.0°C suggesting that the typhoon translation speed plays important roles as well as typhoon intensity in surface cooling. Upwelling induced by the slow-moving typhoon wind leads to typhoon track confined cooling area and the right-hand bias of cooling is slight. 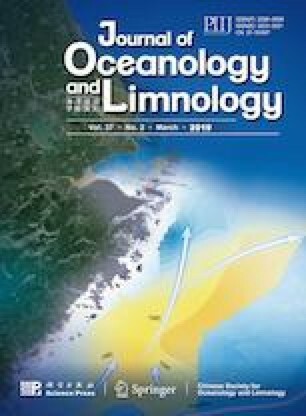 The mixed layer cooling and thermocline warming are induced by wind-generated upwelling and vertical entrainment. Vertical entrainment also led to mixed layer salinity increase and thermocline salinity decrease, however, mixed layer salinity decrease occurs at certain stations as well. Our results suggest that typhoon translation speed is a vital factor responsible for the oceanic thermohaline and dynamical responses, and the small Mach number (slow typhoon translation speed) facilitate development of Ekman current and upwelling. We would like to thank Dr. LIU Ze, LIN Feilong and the crew of R/V Dongfanghong No. 2 for collection of the in-situ observation data.